Our law firm has obtained millions of dollars in combined settlements for our clients who have suffered harm as the result of wrongful or negligent acts (results not a guarantee or typical). Carash Law has over 55 years of combined litigation experienve. Joel Carash, Esq. is a member of the Million Dollar Advocates Forum. Our office will engage the services of expert witnesses, accident reconstruction experts, bio-mechanical experts, and psychological experts when necessary in an effort to obtain the best possible result in your case. 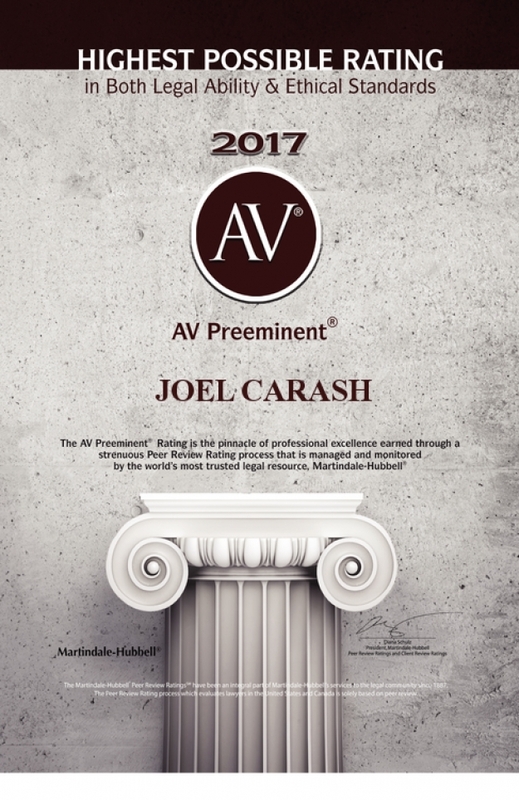 AGGRESSIVE DIVORCE ATTORNEYS : Joel Carash carries the highest possible “AV Ranking” with Martindale Peer Review Rating Services. Call today for a consultation and to discuss our reasonable rates. Joel previously served as a Professor of Law in Family Law and is a also a member of the Collaborative Practice Family Law list of members. 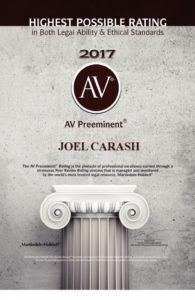 QUALIFIED CRIMINAL DEFENSE: Joel Carash is an AV RATED Attorney and was former Chief Trial Deputy of the Public Defender’s Office and handled one of the first Death Penalty Case in the State of California after the moratorium was lifted. Attorney Joel Carash is one of few private criminal defense attorneys in the local area who has litigated death penalty cases and LWOP (Life Without Parole) and 3 Strike cases through trial and jury verdict and who is also AV Rated by Martindale Hubbell peer review ratings. 6 South El Dorado St.
Carash Law is located in San Jose, CA and serves clients in and around Milpitas, San Jose, Los Altos and Santa Clara County.